A patriotic way to celebrate summer, our country, AND our coasts! While we’ve been loving our spring seashell wreath, with summer in full season, we’re switching up the coastal vibe on our door. It’s time to get patriotic! We’ve been feeling anchor-ish lately, so we chose some navy and cream anchor ribbon, along with plain cream and cream/blue script. We followed the great video here to figure out how to work in all 3 colors. We used 3 safety pins to secure the start of the ribbon to the 18″ wire frame. It took a bit of getting used to (a great little activity to do while watching TV), and then -ugh!- ended up a few inches short! So, we re-did it, this time conserving the inches a bit more. Thankfully this time we came up right to where we started. …and of course, American flags! 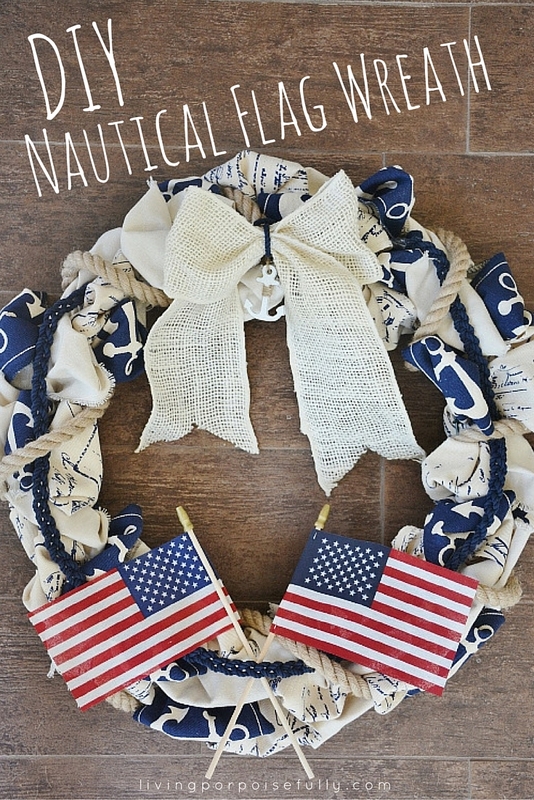 This will be on our door into Labor Day, and we’re already enjoying the summer nautical vibe it’s oozing. We hope you’re having a wonderful summer so far, whether you’re feeling the salty breeze, or just fondly remembering it with a touch of coastal in your home.